Being a 15-year-old, this is the first election during which I’ve really been old enough to make my own opinions. This is also the first time I’ve been able to truly observe others’ reactions to the election. I’ve seen the joy of my friends when Hillary came out of a debate victorious, as well as their fear when Trump pulled ahead in the polls. I’ve heard my peers and classmates tell me their concern about the political climate, how terrified they feel. I’ve paid close attention, and though all of my fellow teenagers have had different reactions to the election, what has unified them is a feeling of estrangement from Trump and his ideology. Adolescence is a double-edged sword. As I said, I’m finally old enough to form my own opinions, but I’m still not old enough to express those opinions through voting. Instead, I must write pieces, have conversations, and try to make my voice heard through other means. Many of my friends have the same issue, struggling to make an impact while adults use their age as an excuse to shut them down and disregard their opinions. Living in the South, many of my friends cannot bring up issues that concern them with their parents for fear of being looked down on and called immature. Luckily, I have a wonderful and supporting family (I marched beside my mother and brother during the Jan. 21st Women’s March; more on that later), but I am one of the few. And yet, as my friends told me how saddened and scared the rise of Trump made them, how alienated they felt from families who wouldn’t let them speak their minds, they never used the word powerless. The effect was the opposite. Instead of letting opposition crush them, my friends pushed back with twice the determination. On the day of the election, my classmates handed out ‘I’m With Her’ pins in the hallway. Online, they wrote fascinating protest poetry responding to Trump’s victory. They attended events, organized online initiatives, formed a tight and supportive community of teens who wanted to make a change. One of my friends even bought a ‘Nasty Woman’ shirt in secret from her conservative Southern parents, and when they caught her wearing it, another girl took the blame and said it was her shirt. In short, despite everything standing in their way, they came together and refused to be defeated. On January 21st, the day after the inauguration, I went to the Birmingham Women’s March with my mother and brother. When I arrived, what I saw made my heart, I saw streets full of people my age, chanting along with the rest of the crowd and proudly holding up their homemade posters. I ran into almost half of my school there. 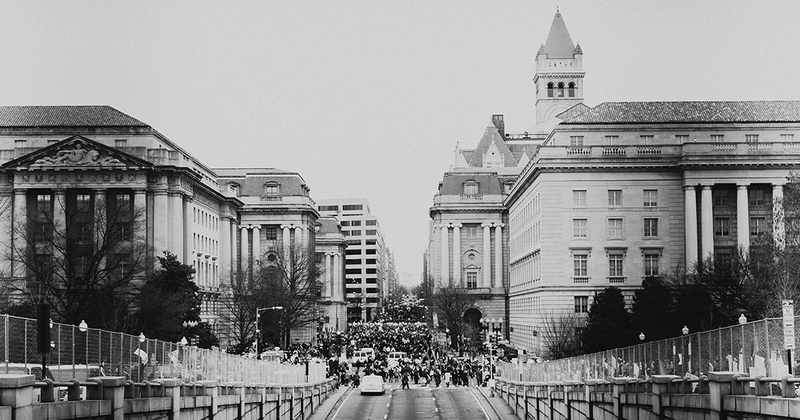 The march was an embodiment of courage. There we were, a group of teens marching with ‘Love Trumps Hate’ posters through the middle of Alabama, a state that voted 63.1% for Trump. And yet, none of us was intimidated. We joked and shouted and laughed and spilled our hearts to one another. We held our posters, yelled our chants, and stood. We couldn’t vote, we weren’t taken seriously by many adults, we faced a political climate that made many of us afraid for ourselves and our families, and still, we stood firm for what we believed in. And so we stand, months after the march, still true to our beliefs, still trying to make ourselves heard. Sometimes it works, and sometimes it doesn’t; sometimes we are able to make a change, and sometimes we are ridiculed and disregarded. But even in the moments when things don’t work out, I know that if all those brave, determined teens turned into brave, determined adults, someone like Trump would never be elected. That night, after the march, I felt so much unity with my city that I had to write about it. The energy of my peers was infectious. I felt so much in those moments. I knew how deeply all my friends who marched cared about these issues, how much some of Trump’s new laws would affect them. But I had seen firsthand their dedication, despite being liberal in the South, despite being opposed by their parents, despite being unable to vote. With all this in my head, I pulled open my laptop, and within 30 minutes, I had written a poem. A few days of revision later, I had this piece. 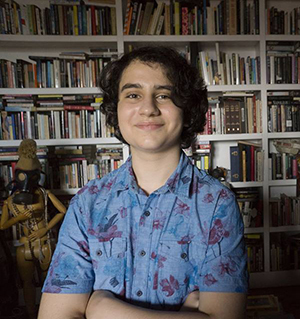 Daniel Blokh is a 15-year-old writer living in Birmingham, Alabama. He is the author of the memoir In Migration (BAM! Publishing 2016) and the micro-chapbook The Wading Room (Origami Poems Project 2016). His poetry chapbook, Grimmening, is forthcoming from Diode Editions in 2018. His work has been recognized by the Scholastic Art and Writing awards and the Foyle Young Poet awards, and has appeared in DIALOGIST, Gigantic Sequins, Forage Poetry, Avis Magazine, Thin Air Magazine, Cicada Magazine, and more. there are still those who do not want it to be ours. Who want us out. with the words, The city is not yours. No. Listen. The words are: in my city, we are taking the city back. like audience to the voices. The voices; how they carry the city within them. the dirty curbs. How they make the city open enough to become ours.